We warmly invite you to participate in the second of a series of interactive focus groups on small business needs. What are you concerned about as a small business owner? What do you wish landlords, the City, and your neighbors understood about small businesses in this neighborhood? Come share with other business owners and begin to develop possible solutions. The ideas gathered in the focus group series will be summarized into policy recommendations. After the focus group, both a lawyer and business counselor will be available for one-on-one questions and answers. It will be a great opportunity for businesses to get quick questions answered as well as make appointments for more in-depth advice. Light refreshments will be served. Interpretation (Spanish & Chinese) available. All Lower East Side and East Village business owners are welcome! Invite everyone on your block. 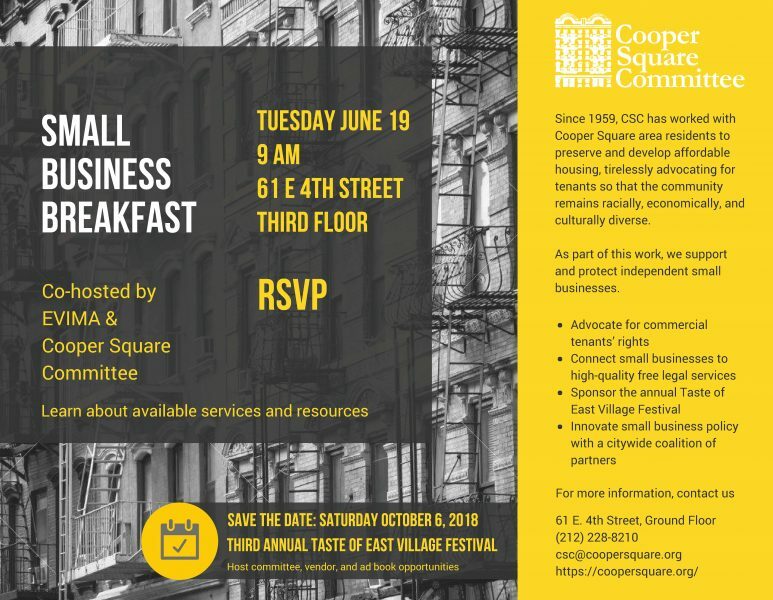 And whether or not you can attend on August 28, please fill out this brief survey about your experiences as a small business owner in the Lower East Side and East Village. We cordially invite you to participate in the first of a series of interactive focus groups on small business needs. The purpose of this focus group series is to hear from YOU. You may know Cooper Square Committee for our tireless work to preserve and develop affordable housing in the Cooper Square area. But did you know that as part of our work we support and protect independent small businesses? We protect and support independent small businesses in the East Village. For more information on any of our small business support programs or to request services, please contact us at csc@coopersquare.org or (212) 228-8210. We can schedule an appointment at our office or your place of business.